Ever thought about how much the internet really affects your everyday life? Well, in Pioneer Entertainment's latest series, the real world and the Wired world are about to collide. Serial Experiments Lain is a mix between the surrealistic and psychopathic feel of Evangelion and the simplistic animation style of Green Legend Ran, with some nice CG stuff on the side. Get ready to leave the mortal world behind and enter the Wired. Close the world. Open the nExt. Well, we survived issue one. Here we are for a second round. What will I say here? I'm not really sure. So hear Tim rant in his State of Anime address and explain just how he got into this wonderful mess known as anime. It's all the Sci-Fi Channel's fault I tell you! 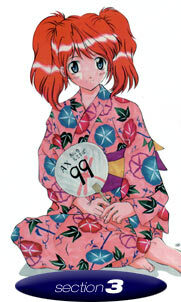 Here we go with part one of the highlights from Anime Expo 99. Then, get all the information on the new announcements made at AX99, including Manga Entertainment's recent acquisition and the official announcement for the motion picture Escaflowne: A Girl from Gaea, coming to the big screen in 2000 from Bandai Entertainment. Want more AX highlights? Those who attended AX99 were in for a treat as attendees were presented with two musical events, a full-blown concert by Iijima Mari, voice of Minmay in Super Dimensional Fortress Macross, and a piano recital by Kanno Yoko, composer for Escaflowne and Cowboy Bebop. Find out how things went. Then, get to know Kanno-san off stage as we chat with her from the AX press interview. Opinionated? The Hypnotic Eye will have something witty (or not) for you here. This issue: An introduction. Get the first "official" words from the Keeper of the Eye. The staples of anime and manga that got us to where we are today. For the newbie, this is your chance to see what you missed from yesteryear. In the true spirit of Retro, here's Dana with a little thing about Ships in Space: A brief look at Space Battleship Yamato and Odin: Photon Space Sailor Starlight. Ready for anime reviews? Well, in addition to the Serial Experiments Lain feature, we have Juubei-chan TV, complete with some major ninja-style action. Then, from the @a! LD Box, Scott takes us on a trip through Tokimeki Memorial OVA 1. Want to see if the Pokémon craze can have a follow up? Check out the Digimon Adventures! 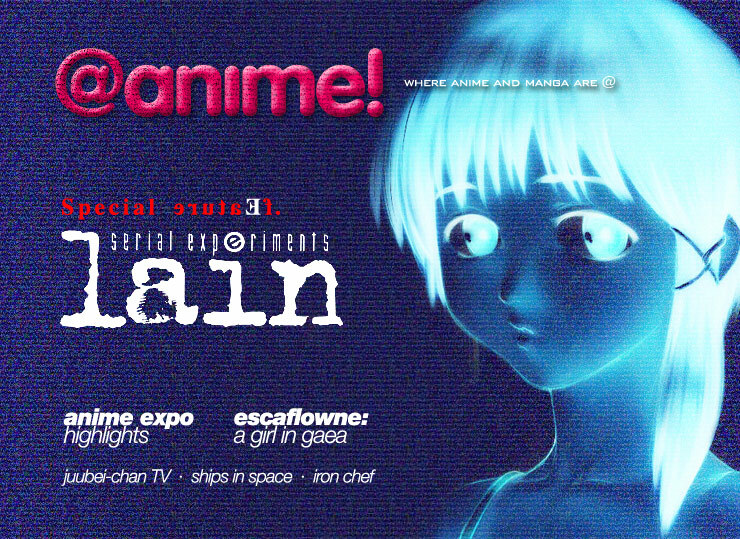 Part of our Lain feature, check out how the dubbed version fares in the first installment of The Dub Files. Here's the second half of why we are here. @manga! will show you some of the latest and greatest in the manga world. We have two offerings from the hottest manga team in Japan, CLAMP: Clover and Suki, Dakara Suki. Then, get a Domestic RetroManga look at a classic, Battle Angel Alita. Ready with your A and B buttons? Here we go! First up, Maria shows us the fast wild side of Pokémon in Pokémon Pinball. Then, James will lead you through a set, Frame Gride and the hottest thing to hit the Dreamcast, Soul Calibur. fan.comm is now online with the first fan feature, a look at Mystery Anime Theater 3000 and MAT3K creator, Jon Kilgannon. Everyone needs a little culture in life. Here's a look at something unique from the other side of the Pacific... Get out your Ginsu knives! 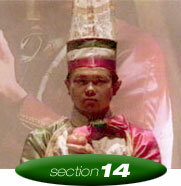 It's Battle Cooking Action in Iron Chef, currently airing on the Food Network.